Codrin is CEO of Digital Authority Partners. He has spent over a decade creating successful digital strategies for both Fortune... Show more Codrin is CEO of Digital Authority Partners. He has spent over a decade creating successful digital strategies for both Fortune 500 companies and startups. 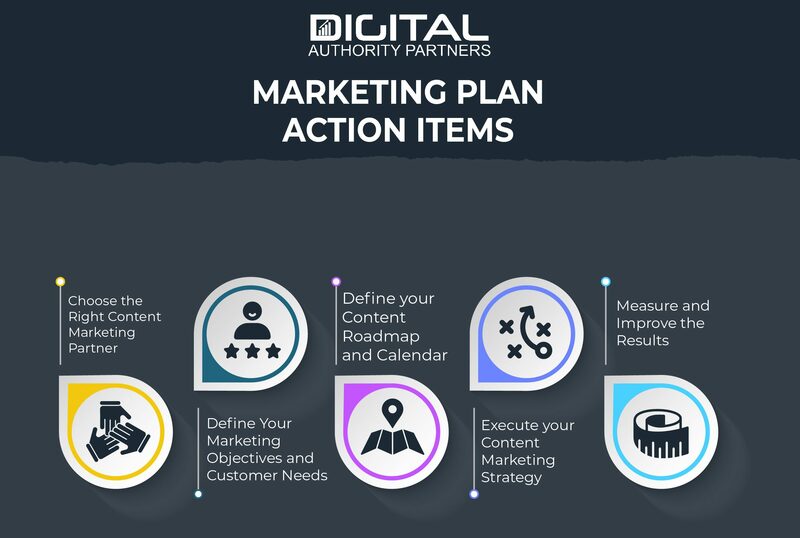 For a limited time, Digital Authority Partners is offering a FREE content & SEO audit to IT companies and marketers interested in assessing their current brand in order to build a robust content marketing plan for 2019. Interested? Drop us a note at [email protected] or call us at (312) 600-5433 for details. IT marketing refers to an array of strategies and activities Information Technology firms must undertake to convince potential customers to choose their products or services. A solid IT marketing strategy should draw the attention of the target audience and create business relationships with future clients. Let’s face it; the competition in the IT market is increasingly becoming cut-throat, and it’s coming from the left, center, and right. With competition from legacy companies and new entrants, it’s crucial that you stand out from the crowd. And one effective way to do this is to market yourself. But, if you don’t get the word out about your services and products, your IT business may become stagnant or even start to die off in the face of competition. Growing Relevant Web Traffic: According to HubSpot State of Inbound report, 57 percent of marketers are having challenges growing website traffic. This figure could be even higher in the IT space, considering that IT marketers have to look beyond traditional channels. Getting Web Qualified Leads: Besides growing website traffic, IT marketers are also struggling to generate leads comparable with their marketing dollars. In fact, according to the HubSpot study, 63 percent say getting leads is their #1 challenge. What’s more, 38 percent of IT salespeople say that getting a response from potential customers is becoming more and more difficult. Needless to say, this is a major obstacle because lead-generation has a direct impact on IT sales, revenue, and company’s bottom line. Providing IT marketing ROI: 40 percent say proving the ROI of their IT marketing spend is one of their major challenges. In other words, IT marketers are struggling to track and make sense of their marketing metrics. They can’t seem to put a finger between their marketing spend and activities. No matter how you look at it, all of these stats call for a great IT marketing strategy. But before we get right to it, let’s take stock of the current state of IT marketing. What’s the current state of IT marketing? More importantly, what’s in store for IT marketers in the next 12 months or so? Let’s take a closer look, shall we? 95 percent of B2B tech marketers say they actively use content marketing. Interestingly, 75 percent say their IT companies will actually churn out more content in 2019 compared to last year. 11.4 pieces of content on average are being reviewed by your decision makers prior to making a purchasing decision. That’s a lot of content to match clients’ appetite. 85 percent of clicks in search results are for non-paid (organic) search. With 90 percent of IT marketers saying that lead generation is their top goal in 2019, content can come in especially useful. That’s why most tech marketers say they’ll tweak their content in 2019 to better engage their prospects and existing clients. 89 percent of vendors in the IT space provide content to help their customers create an ROI for their service. Against this background, it is clear-cut that information technology firms must stay on top of their content marketing efforts. Unfortunately, most IT companies are really bad at it. 80 percent of marketers decry their inability to measure ROI and content effectiveness. 73 percent don’t have the resources required to create engaging content consistently. The question now is, how can IT marketers take content marketing to the next level? That’s why we’ve put together this handy guide – to help create top-notch IT marketing strategy that’ll make you stay ahead of the curve. What Are the Foundational Components to a Great IT Marketing Strategy? Why You Should Invest in Content Marketing for Your IT Business in 2019? How Can IT businesses Improve Their Marketing ROI? In the digital age, a website is your business card. What’s even more important is that people (read: potential clients) visit your website before even reaching out to you or your salespeople. As such, you need to have a rich, easy to use website that’s 100% mobile-friendly and responsive. In 2019, having an IT-grade website is your chance to put your best foot forward in terms of marketing. In fact, it’s your chance to make a great first impression on prospective leads. Which begs the question: what makes a great IT website? A great website that’ll bolster your IT marketing ambitions should be able to load in a snap to prevent abandonment. It should have a clean design that’s free of clutter, and more crucially easy to navigate. In addition, a great IT website should have content that is relevant to a non-technical audience. In our experience, this is the true bane of IT companies existence. It’s what virtually all of them do wrong, even now, in 2019. We get it: you provide technical services. But B2B buyers are NOT technical. The final decision about IT services is often made by CEOs or COOs. Or, at larger companies, by procurement experts. So if there is one thing you need to do in 2019 -that’s auditing your website to make sure people know what you’re selling. Ask your best friend, teenage child, Book Club Buddy or wife to take a look at your site. If they don’t understand in 1 minute or less of checking your homepage what your IT business does – then you need a rebrand. How can potential customers know about you, your IT products or your services if they can’t find you online? That’s why you need to you need to step up your online brand awareness game. Here’s the simple reality. IT services are a commodity. Chances are there are tens of thousands of IT companies operating in America (this includes off-shore based companies that service American clients). And with small exceptions, the quality of the services provided is fairly similar. Or it is perceived as being of similar value by end customers. This sober reality means that it is increasingly difficult for any IT company to stand out of the crowd. We know it’s unfair – but that’s the reality. 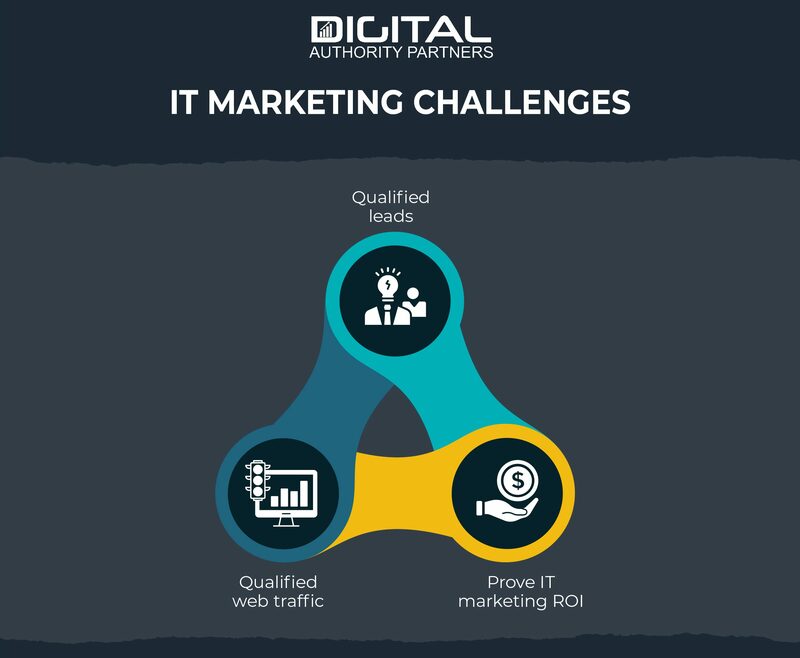 So to counter this unfortunate situation, you need to make sure that your IT marketing digital efforts are beyond amazing. Aka: for buy-oriented keywords in your space, you need to be in the top 3 search results. Many marketers thing that being on the first page of search results is the Mecca of content marketing. Sure, that’s great for the morale. But with the simple reality that 60% of users ONLY click on the top 3 organic search results – then showing up on the first page of search results is not good enough. You need to be one of the top three search results. Organize Webinars: Organizing educational webinars is a key IT marketing strategy where you can target the right audience. As for improving your online visibility, make sure that your webinars are informative, interactive, and exciting. Use social channels to build buzz for your upcoming webinars. Not sure where to start? For $89 a month you can simply sign up for a tool like Bigmarker which allows you to easily run webinars on the cloud (that means inviting people to the webinar, sending emails to attendees and sharing a recording of the webinar, all in one solution). Publish Industry Studies: In the IT space, credibility and social proof is crucial to standing out of the crowd. That’s why you need to publish high-quality industry studies to create rapport and establish yourself as an industry thought leader. This way, you’ll be seen as the authority in your niche and therefore clients will trust you enough to buy your product. Create and Distribute Infographics: We are visual creatures. In fact, studies show that human beings can process visuals 60,000x faster than audio or text. Against this background, you might want to create infographics and other visually stunning content about your brand, products or services. Ensure to distribute these infographics through your blog, website, guest blogs, social media platforms, and other digital channels. Organize Podcasts: Podcasts are all the rage right now. There are more than 500,000 active podcasts, available in over 100 languages, on Apple Podcasts alone. 44 percent of Americans have listened to podcasts. In fact, more than 67 million people listen to podcasts every month. Even better, podcasts offer a great platform for word-of-mouth marketing. The beauty with podcasts too is that they are super easy to implement. And the person you’re inviting to doesn’t really need to prepare that much for the podcast itself (unlike a webinar). Aka – friction points are very limited. 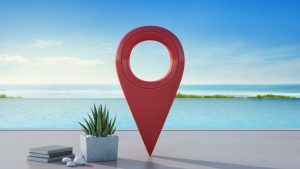 Do Guest Blogs: Find and post on blogs and news websites that have established an online reputation. Since these blogs enjoy high readership, you’ll get your name in front of a large audience and therefore get found online. It’s a no-brainer to include backlinks to your website and social media profiles. Bonus points: as we all know, any backlink to your domain will help your website rank more in Google. Online Community Engagement: Engaging with your target audience can do wonders for your IT marketing strategy. Online community engagement allows you to educate and provide value to your prospects rather than marketing to them. It’s the holy grail of online marketing. Get a Handle on your Content: Generate articles, blog posts, and other forms of content to post on your website. If your pieces are captivating enough, readers will visit your blog and eventually drive more traffic to your website. Make sure your content is fresh, original, and relevant to your target readers. Create White Papers: White Papers are in-depth reports or outlooks that are authoritative, engaging, and convincing on a given topic. So, pick out a topic that applies to your technology product or service. Make sure that your white papers are not run-of-the-mill. They should educate your target audience on specific issues that affect them. Targeted Landing Pages: these are optimized pages that can do wonders for both your on-page and off-page SEO. If well-designed and optimized, landing pages that pull a lot of traffic to your website. It’s crucial that your targeted landing pages are simple, easy to navigate and load in a breeze. In the digital age, social media is the undisputable champ in the world of marketing. And recent figures are backing this claim. With over 2 billion active users, social media platforms now govern an average of 134 minutes of a person’s time every day. How can you make sure your IT marketing strategy is in line with social media best practices? Create your social media strategy from the bottom to top. First, you need to set goals that’ll address your social media marketing hot buttons. Make sure to research your target audience, and then dig a little into what your competitors are doing on social media. Once you have a social media strategy in place, create, curate, and post engaging content across all relevant social platforms, including Facebook, Twitter, YouTube, Instagram, and Reddit. Leverage custom collaterals and content to boost your social media presence and engagement. Don’t forget to stay on top of your social media campaigns, whether paid ads or tailored content. Also, ensure that your campaigns align with your SEO strategy. Support your social media campaigns with cross-promotional tactics. When all is said and done, you can also use social media to promote your blog, articles, and other site content that you want your target audience to see. Use Case Studies: Do thorough research and generate case studies in your niche, clients you’ve worked with, or a specific topic that’s hot in your target industry. Cases studies show that you have a handle on what you are doing. That you are good at what you do. Offer insights, in-depth analysis, and solutions that’ll establish you as an authority in your field. Post Testimonials: How can potential customers trust in your product if it has not been used and loved by someone else? Call them the Holy Grail of marketing, testimonials can help you build trust and credibility with your target audience like no other tactic. Ensure that your client testimonials are genuine and verifiable. Provide Educational Videos: If you want to delight your leads and boost brand awareness in the digital era, be ready to offer value to your potential and existing customers. One way to do this is to provide educational videos. They could be about anything and any topic, from how-tos to tutorials and even guides to your products. And before you think video production is too expensive – don’t forget every employee with a smartphone is their own video-makers. Videos don’t need to be complex or super high-fidelity. With a simple tripod, a whiteboard and a smartphone you can start creating relevant videos for your IT customers today. Speaking Engagements: Sign up for speaker assignments at trade shows, conferences, seminars, and other platforms where you can share your industry insights and knowledge. The reality is simple. You may send out 100 emails to relevant conference organizers who accept guest speakers and only get 4-5 people to be interested. But that’s totally fine. The reality is that when you speak at an event, you showcase your thought leadership and authority. And that transfers to your company and the services they have to offer. Use Ratings and Reviews: Customers love to compare apples to apples. That’s where professionals ratings and users reviews come into the picture. But you have to make it easy for your clients to leave a review or rate you. Oftentimes that means opening accounts with several IT review sites. Go the extra mile and offer them a reward for reviews. After all, 60 percent of customers say they are likely to buy from an IT website with ratings and reviews. Create an Influencer Outreach Strategy – when it comes to IT marketing, especially B2B marketing, influencer outreach is the superstar. It can help you with content promotion, website link building, relationship development. Moreover, it will get your brand message out there. Influencer Management – Running successful influencer marketing campaigns is no joke. That’s why you need to bring in a tried-and-true influencer management agency to take care of everything. PR Strategy – Stay on top of your PR strategy, using press releases and fresh content to keep your brand top of client’s mind. Media kit – Build a robust media kit to distribute to journalists, tech bloggers, and news media houses at the ready. Why you should invest in content marketing for your IT business? Tell your brand’s story. Your IT brand has a story to tell the world, and particularly your target market. When you embrace marketing, you’ll be able to tell this story vividly through original, well-curated content. Original content generates more leads! The highest performing content marketing generates more business. B2B companies that excel at IT Marketing generate 67% more leads than those that don’t. Content marketing delivers better results than both paid search and outbound marketing. As an IT firm, you probably earmark a significant portion of your marketing budget for outbound strategies. That’s ill-informed because content generates 3x as many leads as paid search or outbound marketing. Great content leads to 30-70% increase in site traffic. Good content marketing increases site traffic by 30-7O percent. That’s no small feat considering that’s the #1 goal for most IT marketers. Original content generates 20-30% more leads. Note that content does just increase your current lead generation, it can also deliver 20-30 percent more leads in the long haul, unlike paid ads or search. Content saves you tons of money. If you’re an IT company operating a lean budget, then content marketing is your best shot. It’s been found to help organizations save not just time but also costs by approximately 20 percent. That’s savings you can direct towards better product R&D. How to improve your IT marketing ROI? Your IT marketing ROI is a critical metric that tells you how efficiently your marketing strategy and campaigns are performing. You can spruce it up by reducing marketing costs, increasing income, or both. It’s also crucial that you direct your marketing dollars towards channels that’ll deliver better ROI. 50 percent of your marketing spend should go to Google Adwords (paid search) campaigns. This figure could be higher if you’ve just launched your website or still struggling to get found online. 11 percent goes to SEO campaigns, from keyword research to hiring an SEO agency to purchase SEO tools. 6 percent goes to content marketing (as you can see, content is quite inexpensive). Of course, spend more human resources rather than money on content marketing. 9 percent goes to defray the costs of social media marketing and management to boost engagement and ramp up brand awareness online. The remaining 7 percent will be spent on miscellaneous items, including tracking of content marketing KPIs, influencer outreach, etc. Building an actionable and comprehensive IT marketing plan and strategy is not a day’s job. Here are six crucial steps IT marketers and managers must undertake to get the plan right from day 1. 56 percent of American businesses outsource their marketing to 3rd party agencies – and with great reason. Established marketing agencies know the ins and outs of IT marketing best practices. But not all marketing agencies are created equal. With that in mind, the first step to implementing an excellent IT marketing plan is to make due diligence in order to hire the right agency. 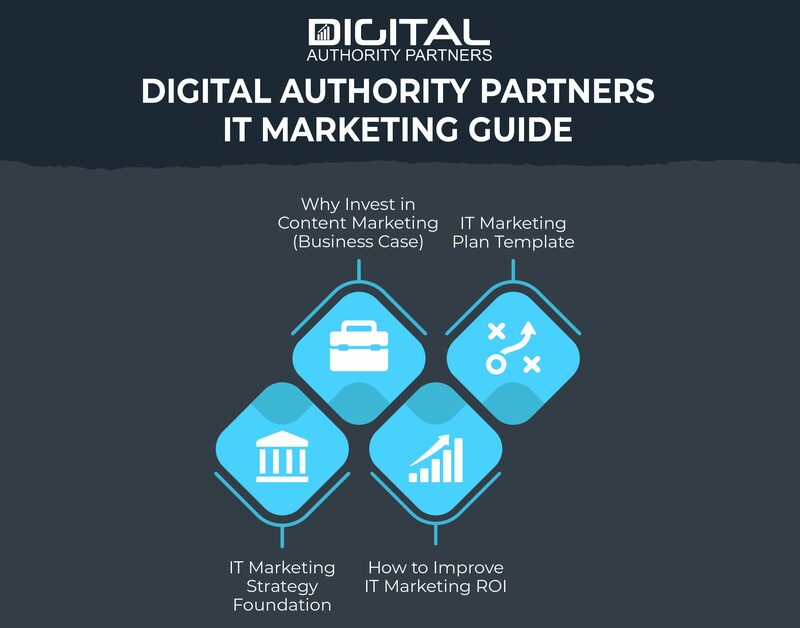 Digital Authority Partners has created a handy 95-question guide that’ll help you zero in on the perfect IT marketing agency for your planning needs. Do you want to grow your online presence? Generate more leads? Retain existing customers? Promote a new IT product or service? Improve brand loyalty? Whatever your marketing objectives are, ensure that they are well-defined and that they align with your customer’s needs and expectations. What do they want to buy? When do they buy and why? Where does your customer spend most of their time online? What drives your customer buying decision? Once you’re sure that your marketing campaigns fit into your IT marketing plan, it’s high time to execute it. Write your advertising and content copy, and then simply place your ads. Whatever actions your campaign entails, execute them. Make sure that your ad message is clear and on the brand. It’s paramount that you measure your returns DURING and AFTER the marketing campaign. If one channel isn’t delivering expected results, switch to another one with a better ROI. Once the results are in, you can use the insights to tweaks your campaigns and enhance your IT marketing plan and strategies accordingly. It’s a smart way to get a bang for your marketing bucks. 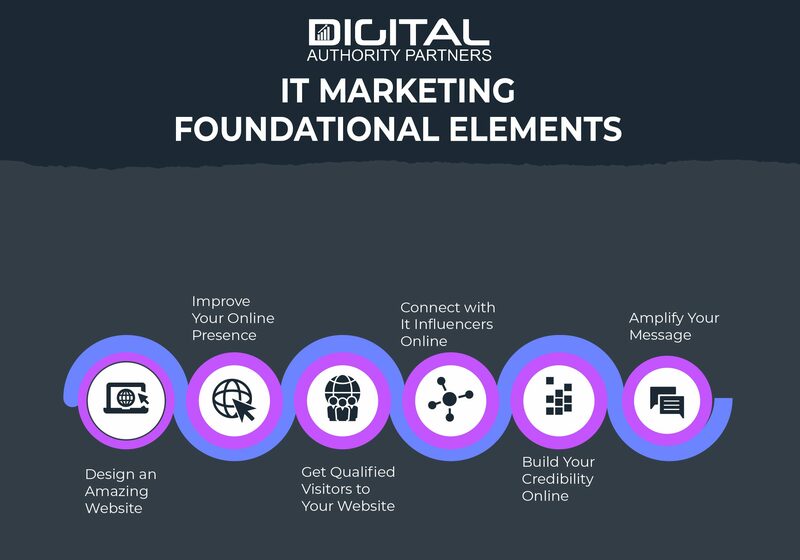 Cover all foundational components to a great IT marketing strategy, from a creating great website to using influencers to amplify your brand message. 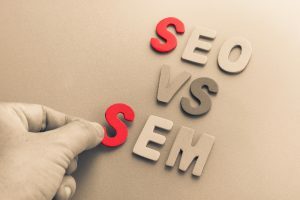 April 2, 2019 120 SEO vs SEM: How Do You Choose? Simple answer, You DON’T!